I remember once being asked by a LUSU volunteer if I thought Lancaster should implement January exams, and replying that I couldn’t really say, having never had to take them. Well, here at McGill (and pretty much every other university this side of the Atlantic), you don’t just get January exams; you get October ones, November ones and of course, December finals. And I can tell you now, it’s a big step up. The workload here can get rather intense, and these past few days as I holed myself up my favourite corner of Second Cup (the Montréal equivalent to Costa), I found myself yearning to get out of the city for a bit. And so, that’s just what I did. During my Orientation Week, I connected with a handful of other exchange students all hailing from various corners of the globe, and a group of us (five including myself) decided to take a weekend trip down to the States. It being the middle of autumn, New England was on all our bucket lists, so we hashed together a rough plan to drive down on a Friday afternoon after class, spend the weekend hiking in the White Mountains and then hit the road again on Sunday and be back in the city in time for tea (or, in my case, my final midterm on the Monday). To me, my brain ready to melt from constantly revising Marxist Critical Theory and Nuclear Deterrence, it seemed like the perfect respite. They say even the best laid plans go awry, and we definitely encountered more than our fair share of bumps in the road (and I’m not just talking about Québec’s pothole epidemic). A misunderstanding with the car rental caused a three-hour delay into our four-hour journey, but nonetheless we eventually made it and, after yet another slight hitch (which involved flagging down a kindly local at 12am on a deserted road in the middle of the woods to borrow her phone so we could email the owner of our Airbnb and get the code to unlock the door) I was ready for a fun but chilled-out weekend during which the only thing I needed to worry about was not falling down the side of a mountain, something I seem extraordinarily prone to doing. 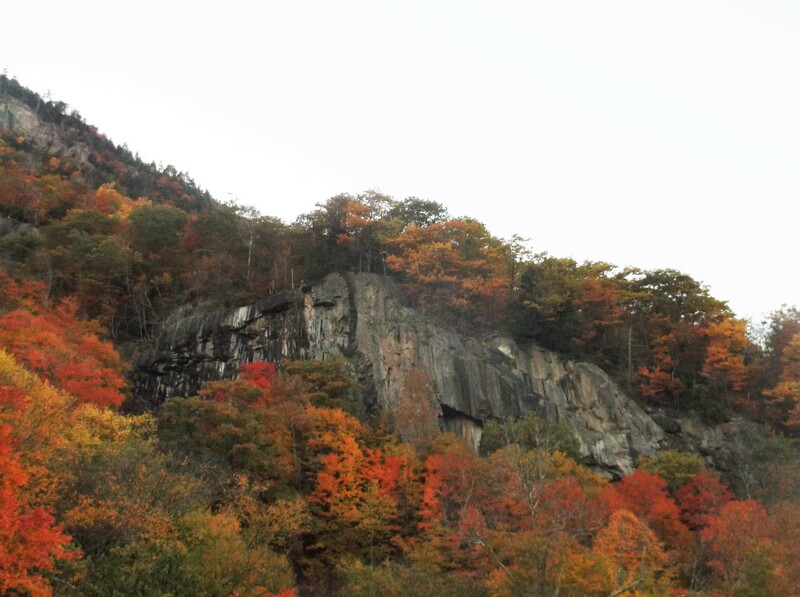 And I have to say, New Hampshire in the fall is truly spectacular. In the week leading up to the trip, I had begun to wonder if I was making the right choice in going. With my final midterm looming ominously on the horizon, I couldn’t help but worry if perhaps I should stay behind and study for it just like everyone else seemed to be doing. But I found that the more I considered dropping out, the more I felt like I needed to go. After all, I didn’t come all this way just to see the inside of a library. I’ve wanted to go on exchange ever since I knew it was possible to do so – even before I had chosen to come to Lancaster! It’s part of my whole reasoning for studying Politics and International Relations as a degree; when I graduate, I want a career that’ll take me around the world and give me the opportunity to explore its many wonders. Of course, I know I’ll never see everything our planet has to offer, but for me that’s the beauty of it. I can see and experience a thousand different places, and there will still be a thousand more. And now, I can tick another place off my ever-growing list. And though I’ve already said it, New Hampshire was breath-taking. I know now why some of the treks are known as the Fire Trails; I have never seen such a magnificent, blazing ensemble of colour in all my life. And, despite a slight delay that was primarily due to me being incapable of making it down a mountain without falling over at least a dozen times (plus one or two issues with directions that were most definitely not my fault), we still made it back before midnight on the Sunday, in time for me to get a good night’s sleep ready to nail my midterm. In fact, looking back this evening, I think I might even have done better in the exam than had I spent the weekend cramming. 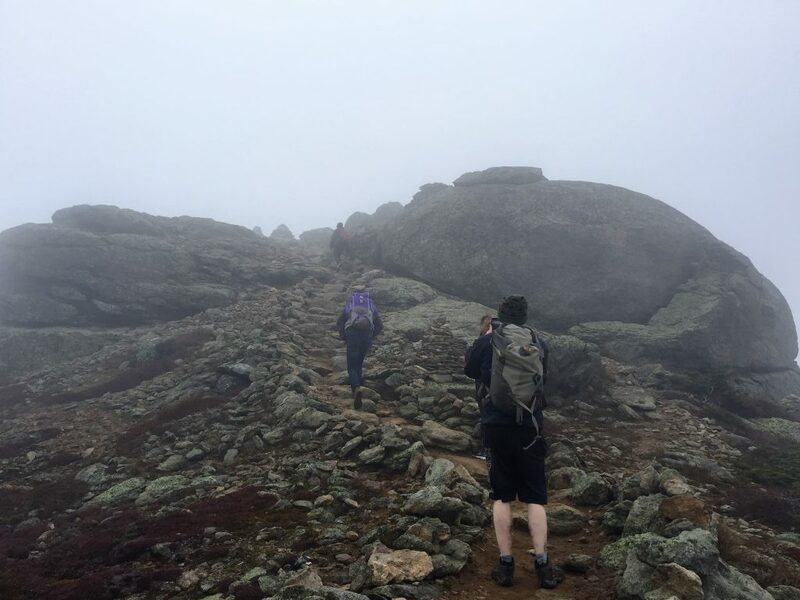 Getting out into the woods refreshed my perspective on things, and standing on top of Mount Lafayette surrounded by clouds and listening to the wind roaring in the valley below, you remember that there really is more to life than one exam that, in hindsight, is only worth 20%. The world might be full of amazing opportunities, but if you’re not paying attention you can blink and miss them just like that. 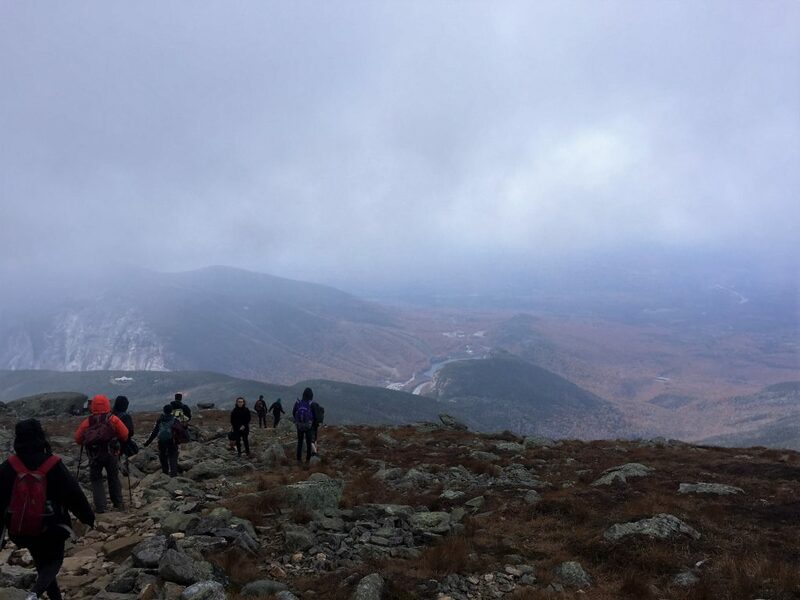 So even though it’s important to take your academic (and other) responsibilities seriously, there’s nothing wrong with cutting loose for a weekend and getting lost in New England with some new friends (plus the occasional chipmunk). Eleanor Roosevelt once said “Do one thing a day which scares you”, and recently, this has resonated with me more than ever. 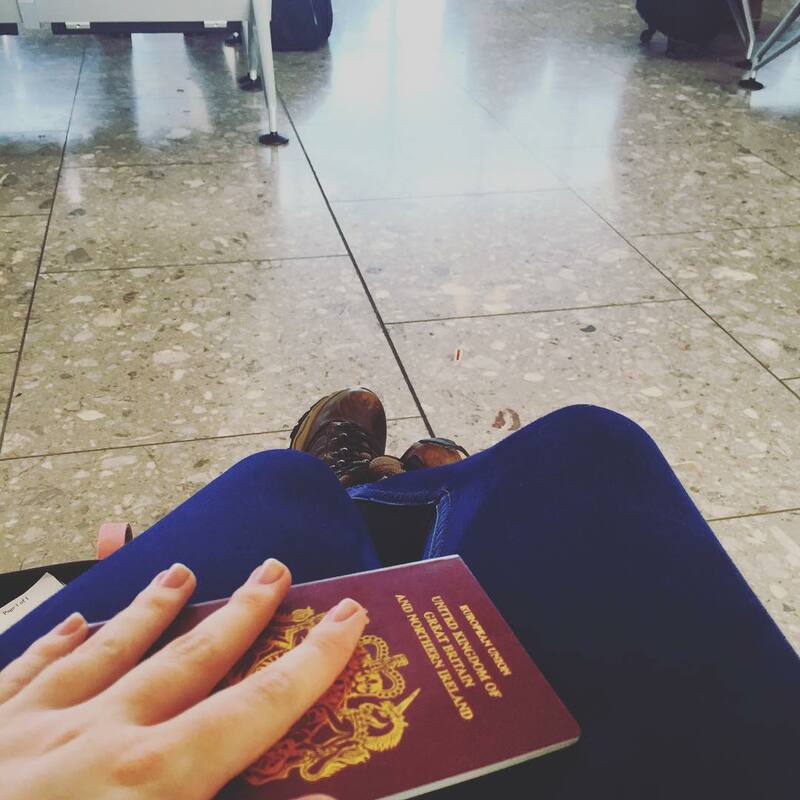 Since leaving the UK a few weeks ago to start my Study Abroad adventure, I have had to do multiple things which scared the hell out of me, but I survived and I am still surviving – even if I’m not quite sure how. Given that studying abroad has always been something I wanted to do (hence why I chose to come to Lancaster), from the moment I arrived it seemed like all of my focus was geared towards spending my second year in another country. And, as of such, I sort of forgot to think about what would happen afterwards. As an example, somehow the fact that I would have to make the journey from England to Canada alone was something I never contemplated until it actually happened. It made me think about how, during the build-up to going on exchange, there are a lot of things you forget about, and then when you remember them it can sometimes be a little scary. This piece is about how it’s okay to be caught off-guard by certain things – especially emotions you weren’t expecting to have – and how at the end of the day, it’s just another part of the experience. For some reason, I never thought that I would be struck quite so emotionally. I’m not really the sort of person who wears their heart on their sleeve – at least, not when I’m in public and surrounded by strangers. And besides, for the past six months or so, the fact that I’m spending my second year of university abroad in the beautiful city of Montréal, was a source of excitement. Don’t get me wrong – there were always nerves – but when I imagined the moment I finally said goodbye to my parents at the gates to airport security, I always envisioned myself striding stoically off into the distance, ready to meet adventure head-on. So when instead my mum and dad turned to hug me for the last time, and I felt the tell-tale sting of tears behind my eyes, a part of me was shocked. The other part of me – the bigger part – was terrified. In those moments as I walked away, I suddenly found myself wondering if perhaps I was making a huge mistake. Thoughts such as “what the hell am I doing?” followed swiftly by “I can’t do this!” ricocheted around my brain in such chaotic fashion that I’m still surprised I managed to make it through Heathrow Security without any mishaps. Now, this doesn’t sound like a promising start, and probably makes this post sound somewhat depressing, which is possibly why no one ever mentions this side of going on exchange – the side which involves frantic nerves, copious amounts of stress and a healthy dose of anxiety (in some cases). But also because, even though it doesn’t always feel like it, this feeling of being stuck at a loose end with no idea what you’re doing, where you’re going or how you’re going to survive the next few days (let alone an entire academic year) is not permanent. As soon as I was through Security, and found myself staring out over the labyrinth that is Heathrow Terminal 5, I realised that I couldn’t afford to panic. Switching off and going to find a corner to rock in wasn’t an option; there were things which needed to be done, such as finding out which gate my flight was boarding from. And, since then, I’ve found myself falling into a very similar pattern. If I only focus on what is immediately in front of me, whether that’s the whole day or just a certain part of it, everything suddenly seems a lot less daunting. As soon as I let myself start thinking about all of the things I need to do over the next couple of weeks and worrying over how I’m going to do them, that same panic starts to set in. And, once it has, it can be quite difficult to shake off. In short, what I’m trying to say is that feeling scared is not a bad thing. It’s what you do with that fear, and whether or not you let it control you, that matters the most. I didn’t think that I would get emotional saying goodbye to my parents, and the fact that I did genuinely concerned me, as it made me question whether or not I was going to be able to cope being on the other side of the Atlantic to them for nine months. But though I had my fears, I didn’t let them stop me, and now here I am, sat in my new apartment in Downtown Montreal, ready to start my adventure at McGill University. So, yes, Study Abroad is an intimidating experience – especially in the beginning. And I don’t expect that to suddenly change overnight. But so long as I keep pushing forwards, and I don’t let my fears and my worries get the better of me, then I have every faith that I’ll make it through these next nine months, and quite possibly be all the better for it once my exchange is over. Because it’s okay to be scared. Being scared just means you’re about to do something brave.